The Tamil Nadu Liberation Army (TNLA) has mapped out a self-styled Vishala Tamil Nadu or Greater Tamil Homeland. In addition to the Indian state of Tamil Nadu and certain other Dravidian speaking regions of India including the Laccadive Islands, the Vishala incorporates Minicoy Island, the 'Tamil Eelam' in Sri Lanka, the whole of the Maldives, Malaysia and Singapore ('Malayanadu'), and Mauritius. This was reported by S. Anand in Outlook India issue of 20 October 2003. Maybe Maldives will be called something like 'Maalh-diu Nadu', but the TNLA seem to have left that up to our imagination. The Indian territories the TNLA is claiming, were under the sovereignty of the Madras Presidency of the British East India Company. Malaysia and Singapore have significant minorities of Tamil speaking people, as does Mauritius. But why is Maldives included in the TNLA claims to an enduring Dravidian empire? 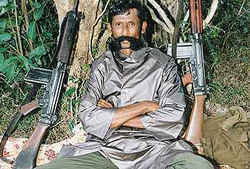 The origins of the TNLA can be traced to Pulavar Kaliyaperumal, a former school teacher and a left-wing extremist, Naxalite, leader. Within the Naxal ranks, he commenced a debate on Tamil nationalism, which led to differences of opinion between the Tamil Nadu unit and the all-India unit of the Communist Party of India--Marxist-Leninist (CPI-ML). While prominent Naxalite leaders in the State of Tamil Nadu like Pulavar Kaliyaperumal, Thamizharasan and Anbazhagan alias Sundaram advocated a separate Tamil Nadu, the all-India leadership rejected the idea. This led to a formal split in the CPI-ML and the formation of Tamil Nadu Communist Party-Marxist-Leninist (TNCP-ML) in 1984-85. The TNCP-ML's armed wing was named TNLA. Sundaram headed the TNCP-ML and Thamizharasan, an engineering student from Ponparappi village, headed the TNLA. Mohamed Thakurufan, Kateeb of Uteem who rebelled against Andiri Andirin, the legitimate regent of King Manoel Siri Dhirikusa Loka in the 16th century, promised to cede sovereignty of the Maldives to the Ali Raja of Cannanore. This was mentioned in a letter sent by a later Ali Raja, Mariambe Ali-Adi Raja Bibi, to the Sultan Mohamed Mueenuddine I of the Maldives. The letter was dated Friday 17 Jamada-el-oula Anno Hegirae 1243 (7 December AD 1827). The Ali Rajas of Cannanore were Muslim rulers who spoke a Dravidian language like Tamil. TNLA may be renewing the old territorial claim of the Ali Rajas based on the Uteem Kateeb's promise. In 1988 a group of Maldive nationals invaded Mal� with the help of Tamil mercenaries. This attempted coup failed when Indian troops were deployed at the invitation of the Maldive regime. Since then a secret military protection pact has existed between the Maldives and India. Certain Indian military maps now include the Maldives within the jurisdiction of the Indian Army's southern command based in Bangalore. Bangalore is within the area claimed for Vishala Tamil Nadu. Sri Lankan (Muslim) Moors are Tamil speakers. Tamil and other Dravidian languages are the native tongues of most southern South Asian Muslims. This may be another reason why the Maldives is included as part of Vishala Tamil Nadu. The Maldive regime claims that the Maldives has a 100% Muslim population. The Divehi language of the Maldives and Minicoy is not a Dravidian language like Tamil or Malayalam. It is an Indo-European language akin to Farsi, Kurdish, the northern Indian languages and Sinhala of Sri Lanka. Like Sinhala, Divehi has some Dravidian influence in its vocabulary, but recent linguistic research has proved conclusively that Divehi shares the same root language as Sinhala. The Maldivian language developed, concurrently with Sinhala, on the basis of that original non-Dravidian language. The Maldive people share some cultural values and practices with the Dravidians. Nevertheless, this does not warrant a Tamil claim over the Maldives especially when the Sinhala-speaking areas of Sri Lanka seem to be spared. "I am convinced that Tamil culture and Maldivian (including Sinhala) culture are incompatible. I am sure those incompatibilities are at the heart of the civil war in Sri Lanka. "The biggest difference between Tamil and Maldivian culture is that Tamils arrange their kids' marriages, putting great emphasis on advertising their kids in newspaper ads, through brokers, and so on. Then they spend an enormous amount of money on a lavish, huge marriage party and on buying large quantities of gold to show off to the others. That is the hallmark of their culture and much hype and all their preoccupations are centred on this 'proper marriage' obsession. This marks deeply their behaviour and way of life. "Maldivians mock and ridicule Tamil obsessions, in videos and songs, where a Maldivian young man dresses like a Tamil, with a big moustache and in unfashionable clothes, and a girl dresses like a Tamil woman, with a sari and pretending she is so shy and virtuous putting up a silly smile. Maldivians live in a more open and less pretentious society and they think that Tamils are ever so busy trying to show off and pretend they are what they are not, that they don't know how to enjoy life. "In Maldivian (and Minicoyan) society parents play no role in marriage arrangements. Young men and women are free to choose their own partners. Dowry and female child foeticide are unknown things in Maldives and Minicoy. This permeates the whole of their social attitudes and makes Maldivian society so different from Tamil society as day and night. This enormous incompatibility of mores makes the claim of Vishala Tamil Nadu on Maldives misinformed, ignorant and ridiculous. How could such two totally different peoples be part of the same nation?" The annual Maldive embassy to Ceylon (Sri Lanka) was an ancient ceremony probably dating back to the time of the kings of Kott� in Southern Sri Lanka. It survived through Portuguese, Dutch and British rule on Ceylon. Maldive ambassadors were accredited to whoever ruled in southern Ceylon. The Maldives did not maintain a permanent diplomatic mission in Sri Lanka until the early 1920s, when it was established by order of King Siri Kula Sundhura Katthiri Bawana (Mohamed Shamsuddine III) and accredited to the governor of King George V. For well over a century, until the late 1940s, it was the British governor who received the Maldive ambassadors. However, the proceedings connected with this ceremony resembled the way foreign ambassadors were received at the court of the kings of Kott�. The missives addressed to the ruler of Colombo/ Kott� were written in Divehi and affixed with the Katthiri Mudhi (Seal of the Maldive Kings). At the colourful state ceremony in Colombo to receive the Maldive ambassador, the latter would speak in Divehi and would be translated to Arabic by a Maldive interpreter. The Arabic would then be translated to Sinhala, Portuguese, Dutch or English (depending on the official language of Sri Lanka at the time) by a Moor. The Moors were Tamil speakers. At some stage it was decided to eliminate the Arabic and the Maldive king sent abroad someone to learn Tamil. When the person returned after learning Tamil, the king summoned him and ordered him to say a few words in Tamil to find out what the language sounded like. "Your Majesty", replied the interpreter following a perfectly executed kurunees salute, "if you place a lot of pebbles in a tin can and shake it, that would be Tamil for you sire".